The observed and projected impacts of climate change are described for several sectors: The impacts on food (agriculture, livestock and fisheries) contain changes in the rice production, Ukikawa symptoms (detached fruit skin and flesh) in mandarin and grapes due to high temperature and delayed seaweed harvests due to a later cooling down of water temperatures in autumn. It is expected that poor ripening of rice increases, a shift northward will take place for apple cultivation lands (Fig. 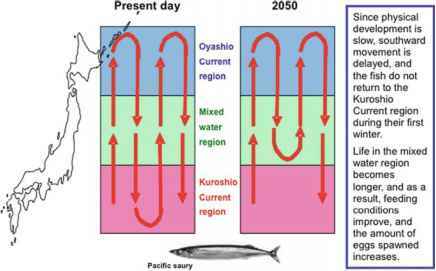 1.38), a northward shift of damage and pest, water shortages during rice planting, a decreased habitat for salmon and northward shift for herring, slower growth of the Pacific saury (Fig. 1.39) and a northward shift of suitable aqua-farming of Blowfish (Torafugu). The impacts on water environment and resources are increasing restrictions on water intake and water supply (Fig. 1.40), an abnormal bloom of blue-green algae in lakes and marshes and the increased use of groundwater. It is expected that the risk at drought will increase, the amount of landslide disasters will increase de to a higher frequency of short-term extreme rainfall, the temperatures in rivers, lakes, dam reservoirs and groundwater will be elevate resulting in a higher probability of blue green algae blooms and the groundwater will be salinated due to a rising sea level. 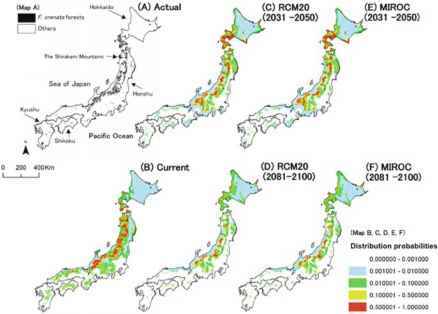 an increase of southern species and decrease of northern species along the coast, the bleaching and destruction of coral reefs, an earlier flowering period of Camellia, Japanese ume, dandelions and cherry trees, a later stage of leaves colouring and falling of ginkgo and maple trees and the late blooming in Kyushu due to insufficient 'dormancy breaking' caused by low temperatures. 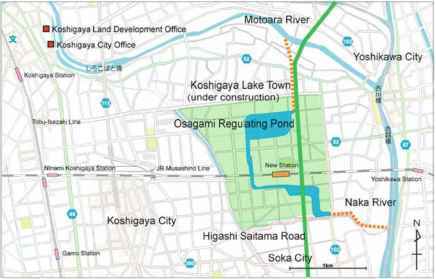 It is expected that a decrease of distribution areas suitable for Japanese beech tree forest (Fig. 1.41), sub-alpine belts will take place, a rapid decrease in alpine plant communities, the expansion of bamboo groves in Tohoku region, increased stagnation in lakes and oceans, invasion of alien species in freshwater regions, changes in food chain caused by diminishing sea ice in the Ochotsk Sea and an escalation of the effects on plankton and calcified organisms due to ocean acidification. The disaster prevention and large coastal cities are affected by increased threats of flooding and damage as a result of storm surges and typhoons, leading to inundations and an increased frequency of extreme rainfall (Fig. 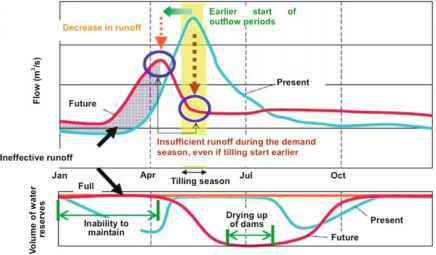 1.42) and a decreased amount of water available in the Kiso reservoir. In the future an increase of the intensity of typhoons is expected, they will probably shift their course leading to other areas at risk and cause increased wind speed and ocean waves. 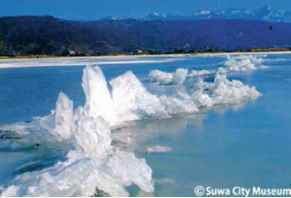 Furthermore, it is expected that wave-overtopping rates due to sea level rise increases, the erosion and loss of sandy beaches will diminish 90% with one meter sea level rise, the flood control safety levels decrease and landslide disasters increase due to snowmelt. The impacts on health show an increase in excess mortality due to heat stress, record high number of heat stroke patients (Fig. 1.43) and the expansion of the distribution area of the Asian tiger mosquito, transferring dengue. It is expected that all of these impacts will increase in the future. Climate change influences also citizens and urban life. The impacts that are defined are the rise of international prices for wheat, corn and Soya-beans, earlier blossoming of Japanese ume and cherry trees, tourist and sport climate conditions and an increasing reporting on akenoumi (lake fails to freeze) and No Omiwatari (no cracks appearing on a frozen Lake Suwa, Fig. 1.44). due to less snowfall and the impact on local culture due to a loss of sense of seasons caused by snow season shortages and changes in cherry blossom season.